June 16th (reservations must be made before June 9th). The guest author will be Dr. Harold Battenfield. 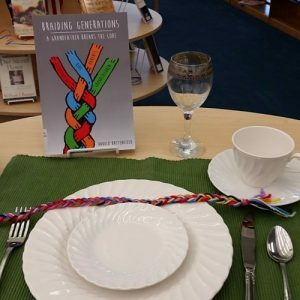 He will be discussing his book, Braiding Generations: A Grandfather Breaks the Code. July 21st (reservations must be made before July 14th). The guest author will be Todd Fuller. He will be discussing his book, 60 Feet Six Inches and Other Distances from Home: The (Baseball) Life of Mose YellowHorse. August 18th (reservations must be made by August 11th). The guest author will be Jennifer Latham. She will be discussing her debut novel.